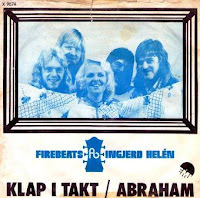 As part of my life’s calling to collect every version of Bonnie St. Claire’s Clap Your Hands and Stamp Your Feet released at the time; please find enclosed the Norwegian version. Ingjerd was one of Norway’s most popular artists during the 1970s. Here she is backed by The Firebeats (also known as Firebeats Inc.), who were a popular beat combo during the 60s. Anyhow the Norwegian entry is not a must have, but for completists only. It’s cute rather than killer and is in fact rather anaemic overall, but Pete Koelewijn classic still shines as a great song whatever the setting. 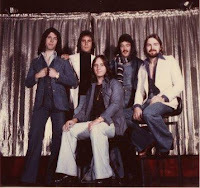 Neil Scott (guitarist): We recorded and mixed 4 songs in 8 hours during the session at 10 cc’s Strawberry Studios in Stockport ! 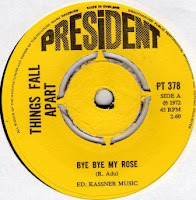 In My World, the B side, Mr. Won't you Help Me, Ebenezer and There Will Come A Time which was never released. We used a session keyboard player - a girl who played Mellotron on In My World and piano and Mellotron on There Will Come A Time. We were all from Manchester but shortly after the session and back in Perth, we added an Aussie on guitar and keyboards and we bought our own Mellotron! 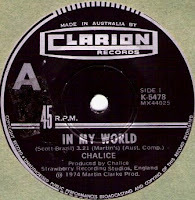 But the question remains...how did Chalice end up in Perth? Neil Scott: We ended up in Perth because our agents in Warrington sent us to London to audition for a guy from Australia who became our manager once we arrived. He actually wanted Mud or Paper Lace but they weren't available, so I suppose we came third! Jeremiah are another bunch of likely lads from Belgium. OK, they have a slight Mutant Geek look (must be something in the Belgian water supply...Looks like they drank from the same well as The Garnets! ), but musically they certainly give Lennart & Dagleth a good run for their money. Dance Dance Dance is a sprightly and vibrant rockin’ Powerpop tune -Duck Stab even noticed a vocal similarity with Chris Stamey...The B side is also a fast-paced melodic tune with monkey-beat chugging to the fore. 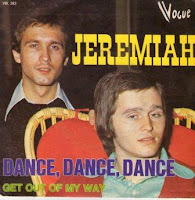 I would love to know about this bunch, there is at least one other single with Jeremiah as a three piece...or perhaps they just decided to put their best faces forwards on this one? This is the Dutch Zoo (not the French one) with another prime example of the fine art of the Dutch foot stomp. OK, Walking doesn’t quite have the overall killer attitude of the best of Nederglam ©, but this marching sing-a-long is nailed down by the mother of all goose-stepping stomps with a slight Creedence ring to the guitar riff. So no hippie walk-about here then, this is heavy heavy Neder-thudding! 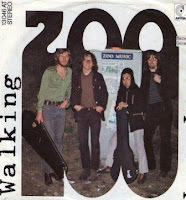 Zoo hailed from Groningen (The Venice of the North), from the remains of a band called Spring. At first they were known as Groninger Muziek Vereniging (Groningen Music Society), but Zoo had many line-up changes. 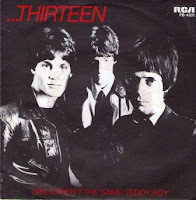 Most of their songs were written by Eddie Meyer and Bert Veldkamp, but their most well known member was drummer Peter Walrecht who would later on play drums in other bands from the Groningen muic scene like Herman Brood & His Wild Romance, New Adventures and AA & the Doctors. Their music could be described as prog, and they were influenced by The Beatles , Yes and Argent. In 1971 they played as a support act for Argent in Groningen. Later on they played the Paradiso and also did a TV-show. 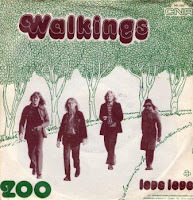 Zoo made 4 singles, of which Walking is the 3rd. Walking was written by Peter du Bois and Peter Bewley who would later gain chart success with Lemming. They also made an LP for CNR in 1973 which contained no less than 6 Beatle covers! Thanks to Jos for the background info! The Fly is a bizarre and haunting excursion from none other than Alvin Stardust (Shane Fenton). The overall mood is set by some neo-Rockabilly vocalisations over an acoustic backdrop with some real out of place orchestration (ARP/Mellotron?). This was probably some form of vanity release (this couldn’t have been aimed at the charts!) on a label run by Billy Fury, who didn’t get round to reinvent himself into a Glitter/Stardust type to refresh his career.